Energy sector experts from Bristol law firm Burges Salmon have advised National Australia Bank (NAB) and Santander UK on the £86m financing of a portfolio of onshore wind projects across England. The Burges Salmon team was led by banking partner Nathan Curtis and provided a wide range of legal advice over the course of the transaction. Further advice was provided by the firm’s construction, projects, planning and real estate teams. 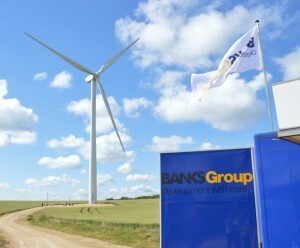 The deal involved seven existing wind farms owned by Banks Renewables, the renewable energy division of North East property and energy business the Banks Group. The new funding will be used for Banks Renewables’ forward programme of onshore wind farms as well as for a number of other projects across the wider group. Nathan Curtis, said: “Now is a critical time for the onshore wind industry in the UK, with growing evidence that it is the cheapest form of low carbon electricity generation at scale. The case for government to reverse its current policy of discouraging onshore wind has never been stronger. “Access to the right sort of capital for onshore wind means the secondary market remains robust, especially for well-developed portfolios such as this. Banks Renewables was advised by accountants PwC and multinational law firm Ashurst on the deal. Additional support was provided by accountants EY and regional law firms Muckle, Womble Bond Dickinson and Brodies.